Learning how to brine a turkey (or any poultry for that matter) is one of the most important things you can do to improve the flavor of the meat and ensure you serve perfect, juicy turkey every time. It's likely you've either cooked or been served turkey that was tasteless and dried out. Since turkey is usually the central focus of Thanksgiving and Christmas dinners this can be a huge disappointment for both the cook and the guests. I can't emphasize enough that if you use this easy, step-by-step turkey brine recipe then you'll never serve or eat dry tasteless turkey or poultry ever again. This is true whether you're making BBQ turkey rotisserie like the picture below, smoking the turkey or just cooking the turkey in your oven. The salt in a brine modifies the protein molecules in the meat to allow the flavored brine to penetrate deep within the meat fibers and is a much better solution than liquid flavor injection systems. It's very important that you only use a fresh natural turkey when brining. Don't use Kosher or self-basting birds like Butterball (or pre-stuffed!) because they've already been subjected to a salt solution and brining will ruin them and make them too salty to eat. Plan ahead - you'll need about an hour per pound to soak the bird in the brine so think about brining overnight so you can cook it the next day. You're also going to need a container large enough to hold the turkey and the brine - I use a large stainless steel stock pot. I've also heard of people using a clean plastic bucket or even a camping cooler. You'll need to keep the turkey and the brine recipe cool so if you can fit the container in a refrigerator overnight that's best. If not, try the camping cooler idea and if the weather's cool enough you can leave it outside or in a shed. You'll be putting ice in with the brine so that will also help keep it cool. I've been using this particular turkey brine recipe for several years now and this is the best one of them all. This particular recipe was made popular by Alton Brown from the FoodNetwork. Tip: When I learned how to brine a turkey I used 1 container (150g size) Knorr Vegetable stock mix to make the 1 gallon of vegetable stock (16 cups water plus 150g vegetable stock mix in the gallon). Makes life even easier. In a large stock pot combine the first 6 ingredients of the turkey brine recipe and bring it to a boil over medium high heat to dissolve the solids. Stir well as this mixture boils so the salt and sugar dissolve. Cool to room temperature and then refrigerate until the brine is cold. Don't put the turkey into hot brine. 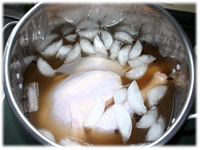 When ready to use the brine (usually the day before cooking) place the turkey breast side down in the brine and cover with 1 gallon (16 cups) of heavily iced water. Make sure the bird is completely immersed in the brine (weigh it down if necessary). Refrigerate 8 - 16 hours turning the bird over once in the brine during that time. Rule of thumb is 1 hour per pound in the brine. On the day you'll be cooking the turkey remove it from the brine and rinse the bird well inside and out. Discard the turkey brine solution. Consider stuffing the cavity of the turkey with aromatics such as lemons, garlic, apples or cinnamon. Herbs such as fresh sage, thyme and rosemary will also flavor the turkey from the inside out as it cooks. 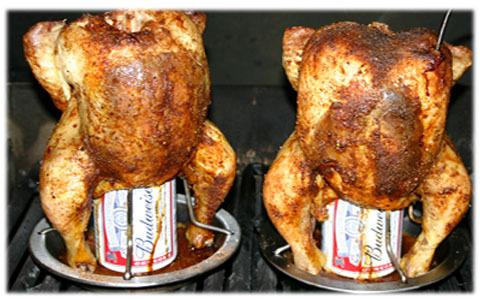 Once you've "stuffed" the turkey it's time to cook it according to your instructions. 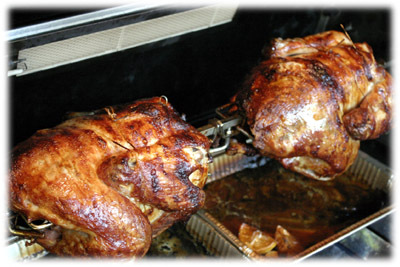 If you're interested, please check this BBQ Turkey rotisserie recipe for great step by step cooking instructions - whether you use a BBQ or not! You'll be amazed (and so will your family and friends) when you brine your first turkey and taste the difference.